The keynote presentation by Hubspot co-founders Brian Halligan and Dharmesh Shah was very thought provoking and we wanted to share with you what these pioneers of inbound marketing discussed that you might want to deploy inside your business. For decades, the funnel has been used in business as a way to structure and describe the pipeline and process flow. But why does it have to be like this? 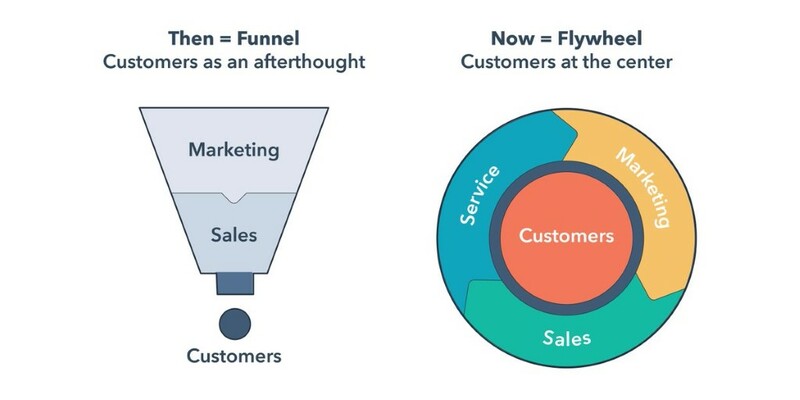 Amazon’s success has been down to creating a continuous process, so Hubspot have examined this closely and suggest retiring the poor tired ‘funnel’ and replacing it with the flywheel. But the flywheel, like all wheels, needs to turn. Apply pressure to a wheel and it doesn’t spin freely, so finding ways to reduce or eliminate this friction is the way forward! In the 1990s sales reps focused on “Engage” as they had access to more information than their potential customers and would leverage that gap and the power that gave them to entice people to their brand. Around 2005/6 this shifted to “Attract” because potential customers and sales reps had the same information at the same time due to the explosion of the internet. Marketers needed to create as much information as possible in order to pull customers in. Today we’re going through another big era shift. Buying habits have altered again and the most important channel now is “Delight”. This is where your biggest return on investment will come from and will be key to growth. Word of mouth is becoming the most influential reason for people to make decisions, overtaking the power of sales and marketing. Some of the most up and coming influential brands in recent times have focussed their attention on delighting their audience, not just clients. This in turn has helped in ‘attracting’ and thus ‘engaging’ their prospects, but also the wider audience to gain a following. You will need to look at your company structure and culture as a whole and for everyone to get behind your own flywheel. Most crucial to this is that your sales and marketing teams change their focus to delighting customers, rather than just closing deals (read our other blogs to find out how). The culture of your organisation must be customer centric. Many organisations think they are but in reality they aren’t truly putting that person at the heart of what they do. Future success will become increasingly about deepening relationships rather than pushing for quick wins. How you sell is just as important as what you sell and improving user experience is much easier than improving your product, which is good news! It will be essential for success to remove potential friction from your flywheel. Consumers now want more self-service, to be able to purchase whenever they choose and to try before they buy where possible. People’s desire for frictionless service can be traced to smartphones as our reliance on them has drastically reduced our patience and increased our expectations. Earn their attention, don’t steal it. Give something to them before you take something that person values, such as their time. Processes are your problem, not theirs. Don’t let your customers be hampered by your systems. Learn to say you’re sorry. If you do something wrong, don’t cover it up. Come clean, apologise and you’ll be respected for it. Pricing should be open, clear and fair. Don’t hide your prices. Display them on your website and don’t offer discounts that could discriminate. Don’t block the exit. If a customer wants to leave, let them. They may want to come back in the future so don’t make it difficult. This shows confidence in your business too. To build a great company in 2018, your customer experience needs to be ten times better than your competition. Historically the best product usually won in the end, but now the best experience generally comes out on top. It’s not all about what you sell but how you sell it. This big shift in consumer behaviour offers massive opportunities for businesses who are prepared to evolve. In the future 80% of interactions need to be self-service, 20% with humans. Today 80% of IT resources are invested in making front line services more efficient. Employees should only come in to handle the more complicated cases that can’t be dealt with using automation. Rather than having lots of specialists, meaning customers get passed from person to person to solve their problems, employees will need to be multiskilled in order to reduce the number of touchpoints and make the customer experience as quick and easy as possible. Continue to create compelling content that pulls people in but keep user experience front of mind. Retire your old funnel and build your own flywheel. Keep investing in sales and marketing but focusing on delighting your customers will yield the biggest returns. Figure out where friction comes from and remove it. Your culture should be customer focused – aim to delight not satisfy. If you need assistance creating a frictionless flywheel for your own business or you’d like to hear more insights on inbound marketing, we can help. As a gold-tiered partner with Hubspot, Secret Source know just what you need to do in order to get a future-proofed strategy in place, so you can not only survive, but thrive! Contact us by e-mailing enquiries@secretsourcemarketing.com, phone us on 01522 700266 or leave your details below and we’ll be in touch - and subscribe to our blog if you’d like to read more.